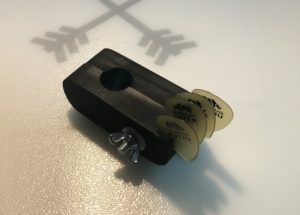 Now this isn’t an original idea, but this DIY pick holder is pretty cool. I originally saw it on YouTube then went about making my own. 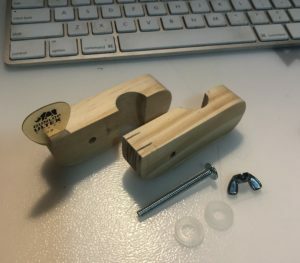 A couple of bits of wood (I used some 30mm by 18mm pine I had handy), a couple of bolts, plastic washer and wing nuts and you are good to go. The excellent tip from the YouTube video was to only drill the hole for the mic stand after putting a bit of cardboard between the two pieces. It means that when you take it out, the drilled hole will sit well on the post. 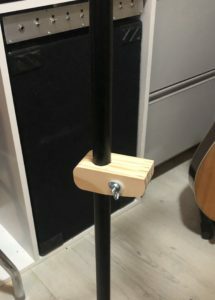 I used a 19mm spade bit and it seems to be the right size for the various mic stands I have. I’m also lucky that the hacksaw cuts to actualy hold the picks were the right size for the .73 Dunlop Ultex ones I use. Check out the video and the pics of what I’ve made and if you’ve got any questions please don’t hesitate to comment below.